conference: American Athletic American East Atlantic-10 Atlantic Coast Atlantic Sun Big East (new) Big East (old) Big Sky Big South Big 10 Big 12 Big West Colonial Conference-USA Horizon Independents Ivy Metro Atlantic Mid-American Mid-Eastern Missouri Valley Mountain West Northeast Ohio Valley Pacific 12 Patriot Southeastern Southern Southland Southwestern Summit Sun Belt West Coast Western California Carolinas-Virginia Central Atlantic Central Intercollegiate East Coast Great American Great Lakes Int. Great Lakes Valley Great Northwest Gulf South Heartland Independents Lone Star Mid-America Mountain East Northeast-10 Northern Sun Pacific West Peach Belt Pennsylvania State Rocky Mountain South Atlantic Southern Intercollegiate Sunshine West Virginia Alleghany Mountain American Southwest Capital Centennial City U. Of NY CCIW (Illinois/Wisconsin) Colonial States Commonwealth Commonwealth Coast Eastern College Athletic ECAC Metro ECAC New England ECAC South (East PA) ECAC South (West PA) ECAC Upstate NY Empire 8 Freedom Great Northeast Great South Heartland Hudson Valley Women Iowa Intercollegiate Landmark Liberty Little East Massachusetts State Michigan Intercollegiate Midwestern Minnesota Interscholastic New England Collegiate New England Small College New England Women/Men New Jersey Athletic North Atlantic North Coast Atlantic North Eastern Athletic Northern Northwest Ohio Athletic Old Dominion Presidents Skyline Southern Athletic Southern California Int Southern Collegiate St. Louis State University Of NY University Athletic USA South Atlantic Wisconsin American Mideast (ny, oh, pa) American Midwest (ar, il, mo) Appalachian (ga, ky, nc, tn, va) California Pacific Cascade (id, or, wa) Chicagoland (ia, il, in) Crossroads League (in, oh, mi) Dakota (nd, sd) Frontier (id, mt, ut) Golden State (ca) Great Plains (ia, ne, sd) Gulf Coast (al, la, ms) Heart of America (ia, ks, mo) Independents Kansas Kentucky Int. (ky, mo, tn) Mid-South (ky, wv) Midlands (ks, ms, ne, ok) Midwest Classic (ia) Red River (nm,ok, tx) Sooner (ar, ok, tx) Southern States (al, ga, sc, tn) Sun (fl, ga) Sunrise (ma, me, ny, vt) TransSouth (ar, ky,ms,tn) Wolverine-Hooiser (in, mi) Alabama CCC Arizona CC Big 8 (California) City U. Of NY CC Foothill AC Georgia JCAA Iowa CCAC Jayhawk Maryland JuCo Mid-State Mid-Florida Mid-West Athletic Michigan CCAC Mountain Valley Ohio CCAC Panhandle Region 19 (nj, pa) Southern Suncoast Tennessee JCCAA Western Jr. College Western Penn. 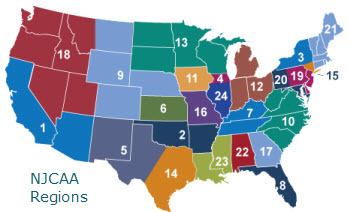 region: 1. id, mt, or, ut, wa 2. az, ca 3. mn, ne, nd, sd, wi 4. co, ks, mo, ne, ok 5. ar, il, mo 6. ar, nm, ok, tx 7. il, ia 8. in, mi 9. ny, oh, pa 10. me, ma, ny, vt 11. ar, ky, tn, wv 12. ga, ky, ms, nc, tn, va 13. al, ga, la, ms, sc, tn 14. fl, ga 15. Independents 1. az, ca 2. ar, ok 3. upper ny 4. upper il 5. nm, west tx 6. ks 7. ky, tn 8. fl 9. co east, eastern mt, ne, wy 10. nc, sc, va, wv 11. ia 12. in, lower mi, oh 13. mn, nd, sd, upper mi, wi 14. eastern tx 15. lower ny 16. mo 17. ga 18. ak, w. co, id, or, wa, w. mt, nv, ut 19. de, eastern pa, nj 20. dc, md, western pa, wv 21. ct, me, ma, nh, ri, vt 22. al 23. ms, la 24. lower il instructions: show none select a conference view ncaa website show none email a coordinator view a college website correct/update info. 1. Select a conference name from the conference drop down list above. 1. Click the NCAA link above. 1. Click a coordinator's name/link. 2. After the email window displays, enter your subject and message and submit the email. 3. If an email window does not appear, you can identify the coordinators email address by hovering the cursor over the name/link. The email address will appear in the lower left hand corner of the current window. 1. Click a college name/link in the right column. 1. Select a region from the region drop down list above. New conference from old BigEast split to American Athletic and new BigEast starting in 2013-14. Boston, MA New conference from old BigEast split to American Athletic and new BigEast starting in 2013-14. (10/2009 - ) Split into American Athletic and new BigEast conferences starting July, 2013. (10/18/10 - ) New conference starting in 2011-12. 016 Mountain East Conference New conference starting in 2013. (11/1987 - ) Conference disbanded after 2012-13.
cac - Capital Athletic Conf. ; ecc - East Coast Conf. ; kiac - Kentucky Intercollegiate Athletic Conf. ; psuac - Pennsylvania State University Athletic Conf. ; rrac - Red River Athletics Conf. ; scac - Southern Collegiate Athletic Conf. ; sliac - St. Louis Interscholastic Athletic Conf. ; sun - Sun Conference, whac - Wolverine-Hoosier Athletic Conf. ; yscc - Yankee Small College Conf. ref coordinators Jeff Risk Jeff Risk Conference disbanded after 2012-13. Diane Plas Conference disbanded after 2012-13. Dan Picard Conference disbanded after 2011-12. Joe Fuhrman f/m AAU Tournaments and Private Leagues in Florida, Maryland, Massachusetts, New Hamphsire, New Jersey, Ohio, Pennsylvania, South Carolina, Texas. Virginia and West Virginia. Ralph (RJ) Bretz f/m Ches-Mont Boys H.S. Rich DiFelice f Ches-Mont Girls H.S. Robert Donato m Central Conference Boys H.S. Ben Dubin m Philadelphia Public League Boys H.S. Joseph Fite f Philadelphia Public League Girls H.S. Mitch Zimmer f/m Whitemarsh Boys H.S. Click headings below to sort up/down.